Marek Kwiek published a chapter on “Academic Entrepreneurialism and Changing Governance in Universities. Evidence from Empirical Studies” in Multi-Level Governance in Universities. Strategy, Structure, Control, Jetta Frost, Fabian Hattke, and Markus Reihlen (eds.). Dordrecht: Springer, 2016. 49-74. Entrepreneurial universities are increasingly important points of reference for international and European-level policy discussions on reforming higher education systems, and especially on a shift in its financing towards more self-reliance and its secure sustainable development in competitive environments. The chapter analyzes academic entrepreneurialism as emerging from recent European comparative (theoretical and empirical) studies. It outlines the theoretical (and ideological) “modernization agenda” of European universities promoted by the European Commission. Case studies of selected European institutions show that the modernization processes in question (and their emphasis on academic entrepreneurialism widely understood) have already been in progress in numerous institutions in different systems across Europe. 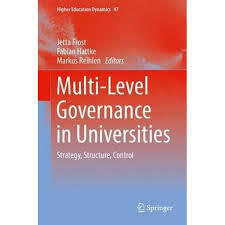 Case studies analyzed in the chapter also stress the pivotal role of changing governance at most entrepreneurially-oriented European universities.